Today's festivities are expected to shatter the record crowds that came out for LBJ's inauguration in 1964. Nearly 2 million people crammed onto the National Mall and along the Pennsylvania Avenue inauguration parade route Tuesday to witness the swearing-in of Barack Hussein Obama as the 44th president of the United States of America. The Associated Press estimate is based on crowd photographs and comparisons with past events. 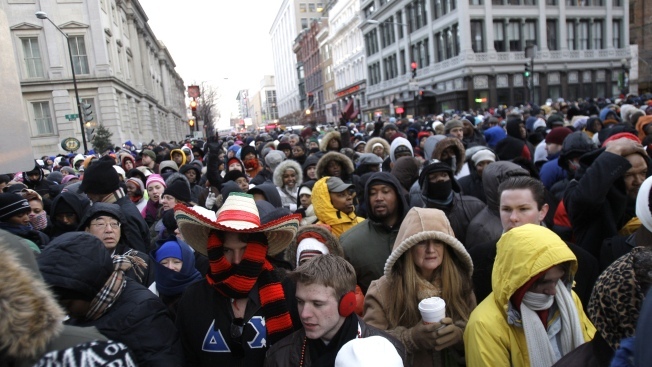 People stood shoulder-to-shoulder at the Washington Monument, about 14 blocks away from the Capitol. The crowd was so tightly packed that some people complained they felt claustrophobic. Further away, people surrounded the Reflecting Pool, watching the inauguration of Barack Obama on large TV screens. District of Columbia fire and EMS department spokesman Alan Etter said medical personnel were having trouble getting to people quickly around the National Mall because of the throngs of people, but that everyone who has needed help has eventually received treatment. "Obviously the crush of people downtown is making it very challenging," Etter said. "We're doing the best we can." "This is the culmination of two years of work," said Obama activist Akin Salawu, 34, of Brooklyn, N.Y., who helped the candidate as a community organizer and Web producer. "We got on board when Obama was the little engine who could. He's like a child you've held onto. Now he's going out into the world." It was standing-room only on the Mall near the Capitol, though the crowd thinned toward the Washington Monument, with people stretching out on blankets. "Everyone's in a good mood," said Brenda Gruss, an attorney who stood watching a jumbotron near the Smithsonian's natural history museum. At the Capitol, a plexiglass shield extended about two feet up from the balustrade around the speaker's platform. Near the lectern were seats reserved for Muhammad Ali, Elie Wiesel and Martin Luther King III. Other groups of seats were saved for past presidents, vice presidents and their spouses — the Clintons, the Gores, the Bushes and the Quayles. Each seat was furnished with a dark blue fleece blanket. A flea-market atmosphere prevailed on downtown streets, with white tents set up to sell Obama T-shirts and mugs as well as food, bottled water, snacks, scarves and footwarmers. The scent of grilled coiled sausages and steaming Chinese food greeted those who walked toward the parade route, more than six hours before Obama would pass by. Lines of riders had formed in suburban parking lots for the Metro transit system by 4 a.m., and by 11 a.m. some 510,000 people had entered Washington's Metro transit system, officials said. Police have projected crowds to be close to 2 million for the inauguration, topping the 1.2 million people who were at Lyndon Johnson's 1965 inauguration, the largest crowd the National Park Service has on record. In 1981, President Ronald Reagan's inauguration drew about 500,000 people, and President Bill Clinton's 1993 inauguration drew about 800,000 people. Warming tents and other facilities on the Mall were late opening because traffic and crowds delayed staffers from reaching them. Ticket holders approaching the Inaugural site on Capitol Hill awaited security sweeps in a line estimated at thousands. Connie Grant of Birmingham, Alabama, said she got up at 3:30 a.m. after coming to Washington with a group. Three hours later she was still on 7th street waiting for police to clear the way into the Mall. She said the wait didn't matter. "I sacrificed and came here. To me, this is very historic. I just wanted to be here." Christian Alderson of Berryville, Va., went to Memphis, Tenn., in 1968 to support the sanitation workers strike and said he was there when Martin Luther King Jr. was assassinated. "That day was sorrowful," Alderson, 73, said as he stood near the mall. "This is a dream come true for me." Alice Williams, a 51-year-old teacher of gifted children from Kansas City, Mo., had the coveted purple ticket that would placed her in front of the Capitol, but she got caught in the crowd bottleneck and instead was stuck a half mile away. "We got blocked off; there was too much traffic and no guidance," she said forlornly. "I've been walking for an hour and a half. All I want to do is see my president sworn in"
World history teacher Calvin Adams of Arlington, Va., said he got up extra early so he could witness history being made first-hand and teach it to his classes. "Eventually I'll teach American history," said Adams, 23. "I'll say, 'This is how it works because I've been there, I've seen it.'"